Snapchat selfies at 30,000 feet? Satellites and 4G stations will provide the in-flight Wi-Fi. While in-flight Wi-Fi is fairly common in the US (albeit slow and expensive), it's not a typical feature onboard aeroplanes in Europe. That's set to change soon thanks to a partnership between the UK's Immarsat and Germany's Deutsche Telekom. 300 high-capacity 4G base stations are to be built across the continent expressly for this new in-flight Wi-Fi, which the companies say is going to be comparable in speed to home broadband. The first stage of the roll-out is going to begin next year courtesy of Lufthansa. 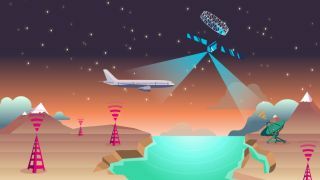 Satellite technology from Immarsat will be used alongside the 4G stations to keep customers connected to the web while in the air. A wider roll-out of the service - plus more airline partners - is expected in 2017. "This will be the first aviation connectivity network in Europe powered by both LTE and satellite combined," said Deutsche Telekom CEO Tim Höttges at a press conference. Planes will switch between ground and satellite networks as they ascend and descend. According to reports calls won't be allowed, however customer feedback says calls on aeroplanes aren't welcome, so there will be measures in place to stop people phoning home from the passenger cabin- you'll have to limit yourself to a few tweets and the occasional bit of news. What we don't know yet is how much this is all going to cost passengers. The firms involved said Wi-Fi pricing would depend on the class of cabin you're in and the amount you've paid for your ticket. How does airplane Wi-Fi work? And will it ever get any better?